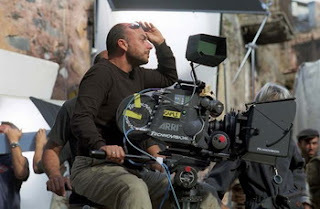 Emanuele Crialese's on-stage ebullience at the opening night screening of Nuovomondo (Golden Door) helped kickstart the celebratory spirit of SFIFF50. 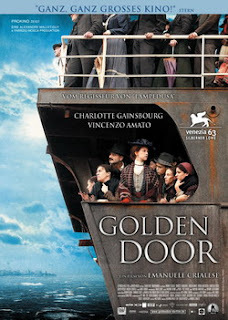 Golden Door, which in graceful, measured draughts portrays the episodic journey from old world Sicily to the new world shores of America, likewise blends a historically-detailed naturalism with fantastic imaginings of the immigrant dream. I thanked Crialese for bringing his lovely and intelligent film to the festival and commented that the presiding image and most intimate metaphor of the film was that of swimming in the rivers of milk. I asked him to speak to his creative decision to present this immigrant dream so literally that it veered into the surreal. Crialese responded that many people in Italy had an "amazing fantasy" of America; they thought America was the promised land where rivers flowed with milk and honey. "America was for a long time—I would say until about 10 years ago—the promised land." This generated some knowing laughter from the audience. By simple analysis, Crialese determined which were the most ancestral and archetypal fantasies of the idealized America and he represented them through the hopes and dreams of his character Salvatore Mancuso (portrayed by Crialese regular Vincenzo Amato who likewise graced the Castro stage with sleek and handsome elegance). When Salvatore dreams of giant carrots floating in rivers of milk, it is fantasy, yes, but it is also—especially in the film's final image—a metaphor to express, "Good, now you are in the river of milk, swim, swim in the wealth, swim and (hopefully) you will arrive somewhere." Crialese purposely left the film's outcome open-ended to insinuate hope and to fasten the dream to his heart and head, even if he has lost sight of America as a more free and just land. Truthfully, he wasn't sure if this dream would come true for his characters, but in his film he wanted to fully merge our mutual ancestors into this dream of the American promise. "Because [Americans] are dreamers," Crialese explained. "That dream is so powerful and strong." While researching for the film, Crialese was struck by how immigrants—writing home to their families—lied about their early experiences in America, not wanting to "cut the dream" or disappoint their families in the old country, aware that the dream helped those family members who had been left behind to escape their old world misery by anticipating their own eventual journey to the promised land of America. You can't imagine how many lies I read, Crialese recounted, people who wrote home saying, "Yes, this morning I swam in the river of milk. This morning I found three or four coins on a tree." The dream—like any ideal held aloft—proved necessary even if, as Crialese qualified, it has been manipulated. The fact that America is a united nation enforces how this dream is shared and how lucky we are as Americans to take part in the dream. The importance and the essence of the final image of the film is Crialese's "small message to say, okay, now, when are we going to stop dreaming and maybe we're going to make the dream come true?" Again, he poses the query without an answer; an evocative question mark hovering mid-air. "I don't know when," he comments truthfully, "but I really hope very soon."